Analyse your game with the innovative and patent pending What-if-Analysis™. Find the areas that will have the most effect on your score allowing you to practice with purpose and efficiency. Set goals in skills based on findings from What-if-Analysis™, or in any statistic you choose. Monitor your progress in key skills you are working on and maintain your focus toward score improvement. See your performance in all well known golf stats. 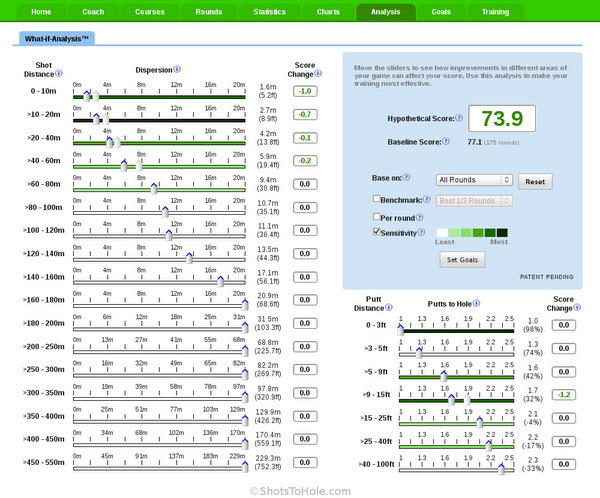 Make clear comparisons to your own benchmarks or to other player categories, scores or handicaps. Visualise your detailed peformance statistics by the distances that you play from. Compare your performance to other player categories, scores or handicaps. View detailed and interactive charts in all statistics. Save your favourite charts and settings for quick viewing. Record of your practice session activities, goals and results. Monitor your work-rate and maintain focus. Have a record of the preparation that has worked for you in the past. Perform regular skills tests and keep check on whether you are improving. Entering your rounds is simple and fast. The most performance relevant statistics are calculated from minimal data entry. You can optionally record more detailed information about each shot if desired. Optionally record many details such as swing thoughts, round notes and tournament details. Enter your rounds using our mobile web app. Simply sign-in to shotstohole.com from your mobile browser.